A Lake Mary can be beautiful. Greg and Cierra were united in marriage at the Lake Mary Events Center in a beautiful traditional ceremony. Surrounded by their family and friends they recited their vows, exchanged rings, and became husband and wife. In Bloom Florist crafted the beautiful florals to accentuate the ceremony and reception locations in the rotunda and in the ballroom of the Lake Mary Events Center. Levan’s Catering created the delectable menu for the couple and their guests. From the passed hor d’oeuvres to the buffet style dinner the cuisine kept the guests coming back for more. Jordan Williams Photography from Maryland came down to photograph the couple’s big day. While Party Shots photo booth kept the guests entertained with a great photo booth and even better props. Laura at Pearl White Events made sure everything ran smoothly and on time. Greg and I are very different in almost every way possible but the one thing that has remained the same is our love for one another. We have loved each other for over 10 years now. There have been good days and bad days but we have worked through it. Through it all of we have loved. We are so tremendously blessed to have found each other at the young age of 17 and 18 years old (yes, Im older than Greg) and have continued to love each other fiercely . There are so many reasons why I choose to love Greg, why Ive fallen in love with Greg. He is a man….in every definition of the word. He is hardworking, passionate, honest (sometimes too much) and dedicated to everything he does. He can be very serious but when he’s relaxed and lets loose he is definitely someone you want to be around. His laugh is contagious….I love every time I hear it. I am so proud that he is the man I get to spend the rest of my life with. The man that has chose to love me in return. But above all things I love Greg because he is an amazing father. Seeing him with our children brings so much happiness to my heart. Pure joy watching him play with Liam or paint Savannah’s nails. He is and always will be my other half, my partner, my husband. Greg wrote: Beauty can be found on all corners of the earth in many different forms and I happened to find beauty in the form of a woman who’s heart flows with unconditional love for all. She is a one of a kind, once in a lifetime person and anyone who gets a chance to be around her knows this. In a world filled with rapacious desires to make more money to buy more things, Cierra truly has only one desire that she would not trade anything in world for, and that is to see smiles on people’s faces. She’s makes the world a better place one person at a time and though she doesn’t always know it, I admire her day in and day out. 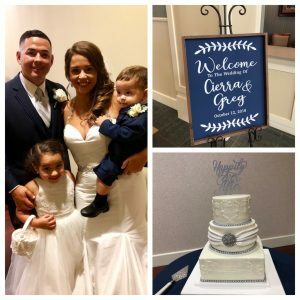 Congratulations Greg and Cierra! We wish you happiness for a lifetme!